Orlando Hernandez, would leave Cuba to become a legend with the New York Yankees. In the mid-to-late 1990s the defection of Cuban baseball players brought additional attention to the sport in Cuba and the issue of its relationship with Major League Baseball and the United States government. 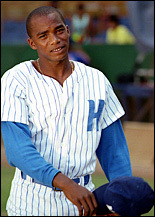 The defections of such players, featured in the 1994 Serie Selectiva league set,* including Orlando “El Duke” Hernandez, Livan Hernandez, Rolando Arrojo and Osvaldo Fernandez and their subsequent signings with major league franchises, became further proof of the prolific status of Cuban athletes. Simply put, U.S. laws and major league baseball itself will not allow Cuban baseball players to play in the big leagues and return home to Cuba with their salaries. And, since 1961, Cuba has not permitted its players to play professionally, with sole the exception of Omar Linares, who was allowed to sign with the Chunichi Dragons of the Japanese pro-league in 2002. To defect, a Cuban athlete must renounce their homeland, claiming political and/or humanitarian reasons, in order to be regarded as a refugee – obtaining residency or legal status in a third country. Most defectors are advised by their agents to not seek status in the United States, in order to avoid the major league draft. Most seek a third country to accept them, thus becoming international free agents, and to sign with the highest big league bidder if chosen. The large majority of Cuban baseball players do not defect. Many players, including Omar Linares and Victor Mesa, were offered millions of dollars to sign had they left their homeland. They, like most others, chose to remain in Cuba and in its unparalled amateur baseball system. In the past few decades, there have been notable efforts to kick-start baseball relations between Major League Baseball and Cuba. In 1975, the MLB Commissioner Bowie Kuhn tried to convince Secretary of State Henry Kissinger that a U.S. All-Star team should compete play in Cuba. The overture was rejected by Kissinger, even though he approved “ping-pong” diplomacy between the China and the U.S. four years earlier. In 1977 the U.S. State Department granted the Houston Astros the right to hold baseball clinics in Cuba. But that’s a far as things went. In 1995 and 1997 Congressman Jose Serrano (D-NY) of the Bronx, introduced, then reintroduced a bill named “The Cuban Baseball Diplomacy Act” in the U.S. House of Representatives, designed to allow Cuban nationals the right to obtain temporary visas to play professionally in the U.S. and return to Cuba with their salaries. The bill gained bipartisan support. About five months later the Baltimore Orioles would play their historic first game against a selection of players from the Cuban Serie Nacional. During the March, 1999 visit to Havana, MLB commissioner Bud Selig was present along with AL president Gene Budig, NL president Len Coleman, Orioles owner Peter Angelos, and representatives from nearly every major league franchise, including several general managers and scouts. The North Americans had discussions with Cuban government and sports officials about areas of potential future cooperation. Over two years earlier, in a January, 2004 interview with MLB.Com, Rodriguez said Cuba would not rule out future exhibition games with MLB franchises, including invitations to spring training in the U.S. or MLB franchises going to Cuba for training. U.S. college and other teams have played exhibition games in Cuba. Over the years, baseball players from such other nations including Japan, Italy and the Netherlands have trained on the Caribbean Island, exchanging training methods and enhancing technical expertise among participants. Today Cuba remains the predominant force in international baseball competition, under the guise of the IBAF. Should the U.S. government’s economic blockade of Cuba come to an end and the Cuban government permit players to participate in professional baseball in North America, there is little doubt that Cuban players would add an exciting dimension to Major League Baseball competition. * Other players in the ’94 Serie Selectiva cards, not seen in The Defectors Photo Gallery, who left Cuba are Andy Morales, Alberto Hernandez and Angel Lopez (1996 Team Cuba Olympic gold medallists), Oscar Macias, Roberto Colina, Jorge Diaz, Francisco Santiesteban, Juan Carlos Bruzon, and Miguel Perez.